An old saying is that people are judged by the company they keep. So, perhaps, are countries. 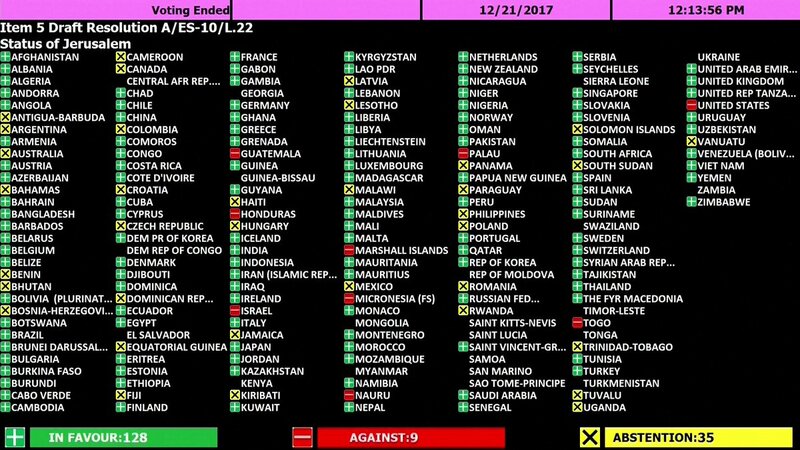 Consider which few countries voted with the US (8) or abstained (35) in the UN General Assembly on a resolution opposing recognition of Jerusalem as Israel’s capital. The eight are Guatemala, Honduras, Marshall Islands, Micronesia, Nauru, Palau, Togo, and of course Israel. Among the 35 that abstained are four countries once in the Soviet bloc and now run by so-called “populist” (i.e., far right) leaders—Poland, Romania, Czech Republic, and Hungary—and several small countries that can’t afford to say “no” to the US, including Bahamas, Benin, Bhutan, Jamaica, Kiribati, Dominican Republic, Equatorial Guinea, Philippines, Panama, and Rwanda. In short, supporting the US was an embarrassing lineup of authoritarian-ruled or politically insignificant countries—all of which, after the vote, were feted by US ambassador Nikki Haley in thanks for their “friendship.” She later applauded a $285 million cut in the UN’s operating budget–taking credit for a reduction made by consensus and thus compounding the policy error with a show of pique. Right, Mel. It’s interesting that China and Russia voted with the 136 (if that’s the precise number) other countries that voted for the resolution.